I’ve written a lot about executive function, but I realized recently that I don’t have a post that explains what EF is. I set to write one post and 4000 words later, I have a short series. This is part one. The three remaining parts will be posted over the next two weeks. So what the heck is executive function, anyhow? Executive function is a broad term that refers to the cognitive processes that help us regulate, control and manage our thoughts and actions. It includes planning, working memory, attention, problem solving, verbal reasoning, inhibition, cognitive flexibility, initiation of actions and monitoring of actions. That’s a nice concise definition, in theory, but what does EF look like in real life? In practice, executive function is a slippery concept. Sometimes it looks like responsibility. Sometimes it looks like self-discipline. Sometimes it looks like being a competent adult. If you have poor EF, people might mistake you for being disorganized, lazy, incompetent, sloppy, or just plain not very bright. Why? Because executive function encompasses so many essential areas of daily living. Nearly everything we do calls on areas of executive function. Cooking. Cleaning. Parenting. Work. School. Self-care. Impaired executive function is why I occasionally leave the burner on the stove lit after I finish cooking. It’s why I have no clue why I’ve walked into the kitchen. It’s why I have so much trouble taking a break from work to walk the dog. It’s why the recycling items sit next to the front door for days before I take them out to the bin. It’s why I write myself a list of the errands I need to run if there is more than one. It’s why I can’t fill out a form while answering the questions that the postal clerk is asking me. It’s why the kitchen looks like a typhoon has hit when I’m done cooking. It’s why I insist on doing things my way even when someone shows me an easier way. It’s why I find myself staring at a conversation partner with no idea what they’ve just said. How is it possible that one thing encompasses so many different situations? Executive function is the control center for our brain. The conductor of our neurological orchestra. The pilot of our brain plane. The CEO of our synapses. The . . . okay, I’ll stop. But you get the idea. Executive function is high level thinking and high level thinking plays a big role in helping us navigate the world around us. 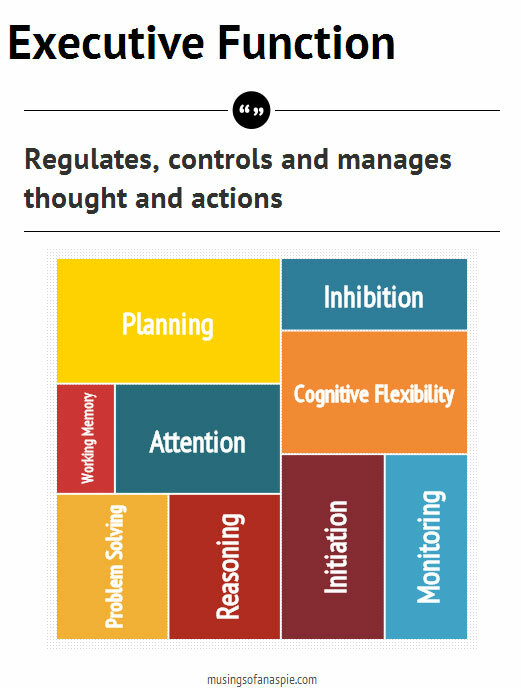 I want to talk about some general concepts related to executive function, but before I do that, let’s look at the components of executive function individually to get a better feel for what EF looks like our daily lives. All of the components can be broadly categorized as either organization functions or regulation functions. Let’s start with the organization group: planning, problem solving, verbal reasoning, and working memory. Attention could fall into either category, depending on how we approach it, but I’m going to include it under organization because I think it’s primarily about gathering and filtering input. Together, the organization functions help us collect and structure incoming data in a useful way. Like executive function, planning is an umbrella term. Making a plan involves a series of subtasks: assessing needs, formulating options, evaluating those options, and sequencing the selected options to achieve a goal. Planning also calls on the EF processes of working memory, verbal reasoning and problem solving. Often “making a plan” or “having a plan” are recommended as solutions for managing other areas of impaired EF, like task switching or initiation of actions. The irony is that making a plan itself can be difficult or feel overwhelming when your executive function is wonky. And sticking to the plan? That’s loaded with pitfalls. It’s easy to overestimate how much you can get done in an hour or a day when your EF is dysfunctional. And when we plan, we tend to assume that everything will go smoothly, which rarely happens. So cognitive flexibility, another executive function, comes into play. And then there is the common executive function fail of planning something out, starting to work on it and then completely forgetting the plan. Also, planning is hard work. If I have a big project to plan, it might take me a couple of days to work up to getting started on it. The planning, not the project. Getting started on the project will take a few more days. “Initiation of actions” is also part of executive function. As you’ve probably guessed, having a plan is not a foolproof solution for managing executive function deficits. Still, planning can lessen the effects of impaired EF, especially if you find a planning method that works for you. Personally, I try to visualize what I want the goal to look like (clean room, finished project, errands completed) and then think about what needs to happen to reach the goal. Often, trying to discern the bigger chunks of the plan first is helpful, then working out the smaller steps that need to come before or after to make the big chunks happen. This results in a nonlinear planning process but it works for me. Not surprisingly, that’s also the way I approach writing. Roughly create a skeleton. Flesh out the details. I rarely start writing anything at the beginning and will often jump around, working on whichever section feels “hot” as my ideas unfold. One final step, in both writing and planning, is to run my draft by someone I trust to check for lingering “plot holes” or for advice on weak spots I’m finding hard to resolve on my own. The doorway thing is really weird. I wonder if they considered the impact of a change in environment from one room to the next? That seems like it would have a bigger impact than the doorway itself. The article concludes its not, but my personal experience would say otherwise. Usually when I walk into a room and immediately forget why I’m there, I can usually quickly recall why if I go back to the room a came from and try walking into the second room once again. I just need to put myself in the same environment where the idea was spawned. I can relate to your idea of planning to plan. Writing is a struggle for me, and am glad to hear some of your insights on that topic. It is certainly why my parents used to refer to my room as the “disaster area”. That was my daughter’s room when she was a kid. Not that I ever called it that, but the image is apt. My mother always compliments me on being able to see parts of my floor. 😀 Whenever I visit my daughter’s apartment, it’s spotless and amazingly well organized. I’m really not sure where she gets it from . . .
EF is what it’s called, huh? I have issues there and sounds like many people do. I can be very organized in one way, making daily lists, etc, but then write so many lists, I never get it all done. My house is messy and not very clean, though I somehow seem to be able to find stuff when I need it. The women in my immediate family seem to have similar issues, although,as far as I know, I am the only one diagnosed on the spectrum. When I was growing up and early adulthood, I kept my room very clean. I recently started a new job and felt like it was taking me a real long time to learn things. Once I learn something, I am usually pretty good and can build my skill and speed. One supervisor told me when trying to learn the register “you have got to learn this faster.” Very frustrating. After a month at that job, I feel like I am more comfortable, more at ease and skillfull. Thanks for all of your insights. That definitely all sounds like executive function difficulties. There isn’t a lot of discussion about how EF can affect our ability to learn new tasks, which is surprising, since things like organization, working memory and attention are all big components of learning. I’ve found that I need “hands on” practice to learn something–just being told how to do it is pretty much useless for me. I relate to this exactly. My brain feels as though information is getting jammed in it when I’m learning something – it is very frustrating. However, once I’ve learned a job I can become very fast at it. Re hands-on practice, me too – written instructions can sometimes help but verbal instructions are almost completely useless, my brain doesn’t retain them for even a few seconds. I enjoy your blog very much. You are helping me better understand the experience of people with Asperger’s. You are very bright and a good writer. Thank you for educating us! While every other person in my family of origin has excelled at it, I fail in the department of executive function. Though I’ve known for a couple years now why I have failed at everything I’ve wanted to do, (EF) I don’t know how to change. People have patiently offered suggestions, I’ve read various articles, etc. When I enthusiastically read your article, I understand the concepts, but when I attempt to fit them into my own memory, they seem to disconnect from each other. I’m not stupid – I did very well when in highly structured school tasks, and have gotten ‘A’s’ at university and have a BS degree. Yet. Tasks turn into such glorious messes. I’m always losing papers. My talent goes nowhere and earns me nothing. And my big goal has stayed out of reach and terrified I’ll never achieve it. Rant away. I totally get it. I’m curious if you’ve even been (or considered getting) tested for ADHD. The way you describe this reminds of the way someone I know describes their ADHD. I can really relate to this! I always had good grades and was considered “smart”, but I often appear to be an idiot when it comes to everyday tasks, projects, etc. if only I could make better plans and stick to those plans I’d be another bill gates. but my life is what it is. Indeed! Planning is really tough. And it calls on so many other aspects of EF. I can’t wait to see where you’ll be going with this series! Excellent idea. I find that I thrive with a lot of structure, often self-imposed at this point in my life. I make lots of lists and often bemusedly notice that my apartment is laid out on a grid (put things in the exact same place or lose hope of ever finding it again). I sometimes forget what I was doing (“why am I here?” – not in the existential, but practical sense) when I enter a room and walk back to my prior spot. Then I’ll remember what I needed to do. I need huge amounts of self-imposed structure too and rely a lot on that trick of always putting things back in the same place. I couldn’t find my favorite shirt yesterday because my husband hung it in a different part of my closet. That was ten minutes of perfectly usable time wasted on searching my closet and passing right over what i was looking for because it wasn’t in the expected place. Ack. Your description of EF deficiency … leaves me stunned, wordless …. This is a life changing concept. ….. I need time to think. I used to be messy. A place for everything and everything in its place doesn’t work for me. Twice as much space as need to store everything I own keeps my place neat and tidy. Writing is difficult, but making an outline is easy. If I keep adding more details to an outline it turns into a paper. Here is the life changing part. I am rarely on time for anything. I’ve lost jobs, friends and opportunities because of my tardiness. I’ve explored different psychological causes: need to be the center of attention, lack of respect for others, self-sabotage, etc. I’ve always thought that being late was caused by a fault of mine. What if I consider the cause a trait neither good nor bad? Perhaps instead of searching for the negative reason for always being late, I could search for the positive traits that inadvertently causes me to be late. Has anybody identified those traits? I’ve never heard of anyone sabotaging themselves with tardiness, so I’d have a hard time believing that anyone could have a subconscious psychological drive to be late. If you’re used to having people blame you for being late, though, I can understand why you might internalize that. What I do know is that people on the spectrum often have trouble with organizing and planning things due to executive function, and we also often have difficulty with time management and time perception (figuring out how long things take/how much time has passed since starting something/etc). So I think that autism could definitely cause a person to be late for things, especially if that person is undiagnosed and expected to operate the same way a neurotypical person would (which sounds like it might be what you’re thinking for yourself, but I don’t want to make any assumptions). Yes, understanding EF impairment as a neurological condition rather than a character flaw makes it easier to step back and look for solution rather than judge ourselves harshly. The thing about being late sounds like “time agnosia.” Some people have no or little “sense of time” making it very hard to estimate how long something will take or to sequence tasks. It’s a form of EF dysfunction and can be a huge problem because, as you point out, people can take it personally. Time agnosia. So that’s what it is! I’m possibly the world’s worst when it comes to recognising the passage of time. I can tell the difference between a few seconds and several hours, but not between 15 minutes and several hours. For example I’ve arranged to meet someone at a shopping mall and they don’t turn up. It’s only when I need to go to the toilet a second time that I realise that I have been waiting a long time. Because I don’t realise how much time passes I seldom remember to check my watch. If I do, it’s probably only a minute or two since I last checked. I notice people get uncomfortable if I check the time too often. Writing a 2 paragraph email can take anything from a few minutes to several hours even for a simple message ta a friend. I just keep correcting it until I’m absolutely sure nothing in it could be interpreted any way other than I intend it to be. (Even then, what I say is often misunderstood). That’s the way it is with almost everything I do. Time is irrelevant. Others find my lack of sense of time very frustrating. I once sat waiting for a friend for an hour before I thought I should give him a ring to see where he was. Turns out he’d been at the same (not very crowded) cafe for nearly an hour as well, sitting in the back while I was sitting at the bar. Setting an alarm is what works for me. For me, executive dysfunction is one of the most disabling parts of being Autistic. And so few people really understand it! I’m 23, almost 24, living at home for a few more months until I head off to grad school, and my mother still lectures me like a child because of my inability to organize my room. My neat-as-a-pin younger sister things I’m just lazy and disorganized by choice. She thinks it’s a personality trait. This is just one example. I could mention cooking, grocery shopping, driving, etc, etc. EF fail is also the main thing that makes me feel the most inept and the least like a capable adult. It’s incredibly frustrating. I’m really glad you’re tackling this whole concept in a series of posts and I look forward to reading the upcoming ones. This needs to be talked about more…so more people understand it. It also just helps to know that I’m not the only one! I felt a lot less bad about all of the structured supports that I need in my life to be a competent adult after finding out about executive function. It helps so much to know that it’s not a character flaw. And I never outline either! I don’t sit down to write until I have an idea of where I want to start (usually the middle) and a general idea of where I’m going but I rarely know what the finished piece will look like. In fact, knowing that would take the fun out of writing, I think. You might find outlines easier to write and more useful if you type them on a computer instead. My outlines contain every complete thought I want to include in my paper, and I just write thoughts down at first until I cover everything I want to say. Then, I just rearrange the parts into something coherent and fluid, and I expand on the points that I think could use some help. When I’m done, I just remove the outline formatting and convert it into paragraphs. When I write outlines this way, people consistently remark about how my writing skills are exceptional. There must be something to this, considering how often I’m told. This article came up at a really good time for me, because I’ve been struggling a lot with getting myself to do things I have planned during the day. I’ve been thinking the reason was mostly depression, because I’ve also been having trouble with that. The part I have trouble most with is initiation of action; sometimes I just sit and stare in space and think about doing what I’ve been meaning to do without actually being able to force myself to do it. I’m planning on changing my depression meds soon, but maybe looking up some executive function strategies might help too. Aw, hon, that does sound like it’s at least in part depression-related. Or perhaps the depression is exacerbating the EF issues. I wrote about a bunch of little hacks that I use in the section about initiation (posting early next week), so maybe those will be helpful to you. I really struggle with getting started on things sometimes so I know how crummy that can feel. I feel like it’s also executive function that helps regulate our emotions. I used to have a very difficult time moving on from mistakes; I’d obsess and feel really bad over it for weeks afterward. It’s still hard to understand that other people actually move on pretty quickly from them and I still have to remind myself to do something else (when I can even do that). I approach my writing in much the same way! When writing stories I usually start at the middle or the end and it’s only then when I figure out what the beginning was supposed to be. EF definitely helps with regulating emotions – that’s actually in the next part, in the “inhibition” section. I think it also plays into the perseverating or catastrophizing tendencies we have, which make it so hard to move on. I bet if we tried, we tie nearly every autistic trait to EF in some way. I’m always impressed by people who know the end of a story before they start. Endings are the hardest for me. And strangely, if I know how a story will turn out, I don’t seem to have any motivation to write it. I actually have problems with the middle of a story. I’ve always loved knowing how a story begins and ends, but I never know how to get to the ending! Usually when I jump around between plotlines it’s because some small detail in the story triggered an inspiration for something else and it’s through this process that the bigger picture reveals itself. I am currently translating your Executive Function Primer (as I fumbled horribly to explain Executive Functioning to my sister unpreparedly) into German so I can either give it to her or use it as notes for explaining things. I was thinking … maybe there are other people who might like a German version of this for explaining or for giving to relatives/friends/acquaintances? Because if you think people might like that, I could do it a bit more thoroughly and send it to you and you could offer it as a download … Just a thought. That would be awesome! I would definitely include it on the EF summary page (with full credit to you as translator) as a PDF download for people who might find a German language reference useful. Another reader has been translating some posts into Dutch for her autistic daughter and I’ve been linking to her “mirror site” from my original posts. Awesome! Did you do that graphic, by the way? In the first part of the series? With all the colorful rectangles with executive functioning processes in them? Because having that in German would of course be awesome, too, for prettiness. And stuff. I made the graphic using an online graphics generator but I don’t remember where. All of this! Clicking through this four part series is a very good description of executive functioning difficulties. Just came across this blog, complements of ADD And So Much more. Check it out – good stuff! I have a real aversion to planning (and referring back to my plan), in much the same way as I used to hate writing outlines for essays at school, which my teachers always told me to do before I started on the writing itself. With the essays I always ended up deviating from the outline and writing whatever came into my head once I started writing, because the new idea that came into my head seemed more interesting than the idea in my plan. Then once I started deviating from the planned structure it didn’t wouldn’t work to try and artificially try to get “back on plan”, I would just follow wherever my ideas would take me. So then the planning seemed pointless because I knew it would always change and that I would be distracted by more interesting ideas. I have the same issue with making a daily “to-do” plan – I can make one, but when something else crops up I tend to find myself diverting attention onto that, and then I forget to refer back to the plan to remind myself what I was supposed to be doing (and if I do, I just feel like a failure for letting myself get distracted from the original plan). So then I throw the plan out the window and just do whatever seems like the most interesting thing to do at the time. Unfortunately, this has negative consequences – it means I often don’t end up doing things that were important to do (like calling someone on a certain day) because I got distracted by something else (often a task I find easier or more enjoyable) and at a higher level it means I don’t feel like I have a very good grip on prioritising my tasks and that I’m not in control of my workload. I need to find a way to make the plan feel meaningful and useful as an overall guide for what I should be doing, even while accepting that I might get distracted sometimes or the plan might need to change – that I shouldn’t just then throw the whole plan out the window. Any ideas? Reading this blog has been rather like peering into a mirror, with the significant difference that you are actually getting something done. I fervently wish that my ADHD/ASD had been diagnosed when I was young instead of in late middle age but, as my grandmother was fond of saying, if wishes were horses, beggars would ride. Unfortunately, I have made no great strides in coping with my disability and now, at age 62, I appear to be in the early stages of dementia or Alzheimer’s disease as well. Lucky me, huh?